I am making plans to leave Niger and go to Burkina Faso. Information in Niamey is difficult, nobody can read, their knowledge of the world, their city, anything is about as far as they can see. Any and all answers to questions is only a guess, they have never flown by plane, they have never traveled to Burkina Faso, most have never went more than 30 miles from home, if that. I need Money, Visas or permission to enter, and Transportation from Niamey Benin to Ouagadougou, also called Wagadugu, Burkina Faso, I am going to try to pronounce it correct eventually. I found one lady from Canada that confirmed, Niger does not have ATMs or bank machines, the only way to get money is by a the very dangerous to do Cash Advance on Credit Card, I never do this under any condition. I will send myself money be Western Union before I give a bank person in the world least developed nation all my credit card information, and a signature to boot. ATMs are normally safe, Cash Advances on money are not, Western Union is pretty good, however about 10 percent fee and expensive. I have over 1000 Euros; I can exchange money and lose 5-10 percent in the exchange. I think I need about 150,000 CFA to make the trip as a minimum safe amount, once I get to Ouagadougou, Burkina, Faso I believe and I am told they have the ATM machines. Cote d’Ivoire, Ghana, Togo, and Benin all have had ATM or Bank Machines, only Niger in this loop of travel has not. I am only 75 percent sure; my - Visa Touristique Entente - is good. I am relying on the advice of the Benin Embassy here in Niamey, they say, no problem. I know, in reality, there is no way they know for sure, they are just saying that it is supposed to be accepted and should be accepted at the Border of Burkina Faso. I have no way to know, unless I take the torture Bus or Bush Taxi trip there and test it. For corruption to work, they need to be able to sell me the Visa, I was able to pay 20,000 CFA at the Niger border, they had something to sell, and it worked. For Burkina Faso to not honor the Visa in a technical way, they have to somehow turn me back at the border and send me back to Niamey for a Visa, if I get out of Niger, or I get the exit stamp, then I can enter Burkina safely. Aagh, this is too nuts, there is a discrepancy in the Visa, I have been traveling too long, I never go to a border with any questions on Visa, I do not exit on the last day, or calculate that close, I make sure there is no discrepancies. The only safe option is to get a Burkina Faso Visa at the French Embassy here, before I take off, I can hopefully hide the Visa and use the Visa Entente as a test. I am supposed to be able to take a bus or bush taxi to Burkina Faso; however, it is a two-day trip minimum or a very painful one-day trip with the Bus. The only way to find out information on the bus is to travel from my Hotel to the Bus Station, ask and hope they are smart enough to speak French, explain and not totally jerks, as is the case about 50 percent of the time. Niger does not speak French, only the highly educated speak French, White people do not take a bus to Ouagadougou, they drive the NGO-SUV-TOYOTA and never get in public transportation. I hope this is an exception, however, I doubt it, I have yet to see people using public transport, and it is just not what the white people do here. They do not associate with the blacks on the person level. I on the other hand have traveled by land all the way from Cote d’Ivoire, to Ghana, to Togo, to Benin, north in Benin to Niger and to Zinder, to Niamey, Niger and now to Ouagadougou, Burkina Faso. I hope to have the energy to travel south in Ghana and back to Abidjan, Cote D’Ivoire to finish the round trip or return path. If I enter Burkina Faso, I am then 100 percent sure this is possible. I need to travel to Burkina Faso to guarantee a backpacker round trip exist. Ouagadougou, Burkina Faso is south, and maybe goes into the more green parts and leaves the Sahel, hard to say until I am there, but Ouagadougou, Burkina Faso appears to be a gate to the region. 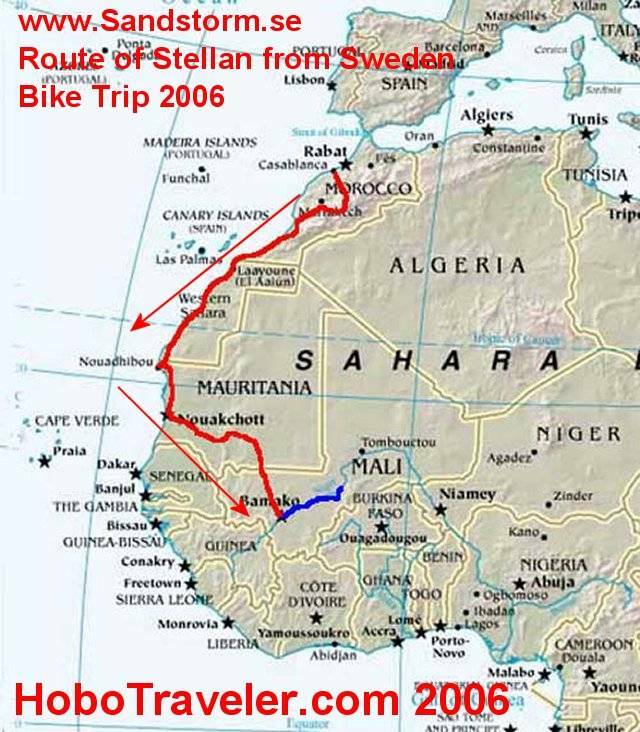 Stellan has already made the trip from Ghana to Ouagadougou; I have collaboration that it is possible. 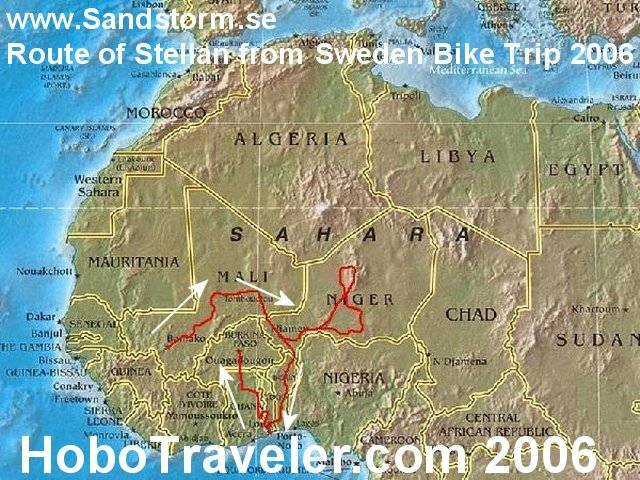 I just need to do the trip from Niamey, Niger to Ouagadougou, Benin to know the complete feasibility of the possible Tourist Visa Entente Trip, with corruption by Niger. I added the arrows to explain the direction of travel, I am not sure, and he may have done some in 2005 and not 2006. I am tired, I do not like Islamic countries, there is nothing to do, except talk Football with the men, the conversations have dropped to zero, all there is here in Niger is an every present apathy and NGO world, a true NGO Disaster zone, caused by the NGOs here, they are the disaster. The place is already a problem, not they are making it a welfare nation fed by the world, and no need to work. It is hot, desert, good for awhile, but to do the desert, I want to do the camel ride across the desert, not the 100 degree bus trips with no air conditioning as was my 13 hour trip from Zinder to Niamey, I do not need to tough it, I have done these trips too many times already. I have options, the one is to fly to Accra from Niamey, but the Visa is difficult here, the other is to fly to Togo, I am not sure yet, I go to some Travel Company and probably Air Burkina if they do exist here, then this Air Afrique or something. Air Moroc flies, also, I will go to the travel agency first I discovered, and then direct to the airlines to see whom is the bigger problem or lesser. I do not like to buy tickets from Travel Agents in known corrupt countries. Niger is know, I have trouble getting change buying bread, the change for plane tickets is the same, and that doe not mean I get a ticket. My gut says, I must go to Ouagadougou, Burkina Faso to fly out of Africa or south. If I get a ticket to Singapore or Bangkok for around 800 USA, then I am out of Dodge. I really want to know how much a ticket from Lome, or Abidjan though is to Asia.